Tom Paolone was grateful when he learned a procedure to repair an aneurysm in his aorta could be performed in Niagara. 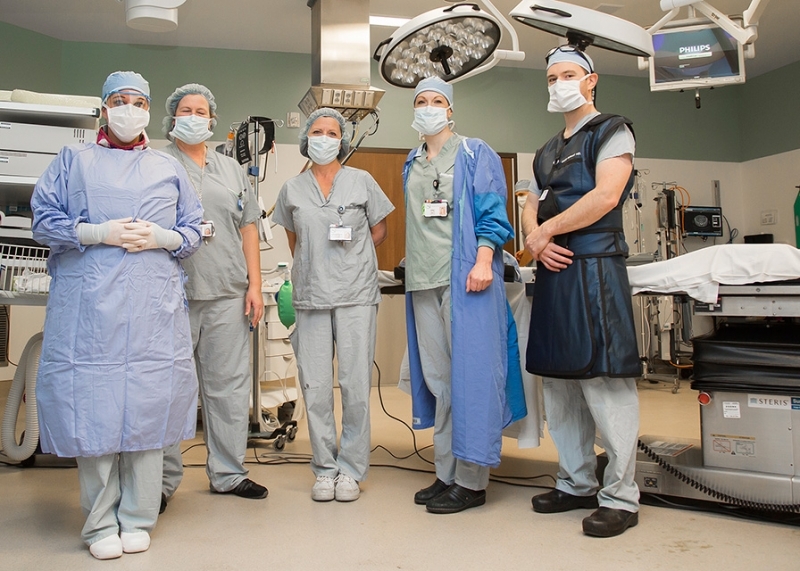 The Welland resident was the first patient to receive the Endovascular Aneurysm Repair (EVAR) procedure at Niagara Health’s St. Catharines Site. The introduction of the life-saving procedure to Niagara is another example of care closer to home for residents in the region. As of August 2017, nearly 30 EVAR procedures have been performed at Niagara Health. Niagara Health surgical teams started performing the innovative EVAR procedure in February. The aorta is the main vessel that carries blood from your heart to the rest of your body. An aneurysm occurs when part of this vessel has weakened and ballooned out. The major complication is aneurysm rupture, which requires life-saving surgery. Open Repair, in which a large incision is made in the abdomen to expose the aorta and the aneurysm is repaired with a graft. EVAR, a less-invasive technique in which a surgeon makes a small incision in the groin and threads special instruments through a catheter in the artery to the aneurysm, where a stent and graft are placed to support the aneurysm. Patients who receive the EVAR procedure spend less time in hospital after the procedure, often returning home the following day.